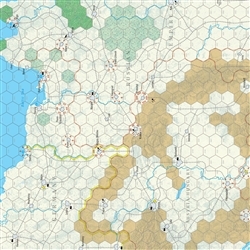 The map covers the entire war zone in Europe (36 miles per hex) and the Middle East (at a slightly larger scale). Terrain includes key cities, certain cultural and religious sites, primary railroads, and sea zones connecting it all. 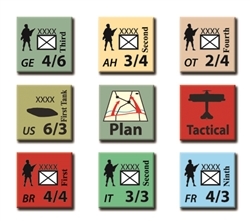 Counters represent field armies, with some specialized corps and a few markers. 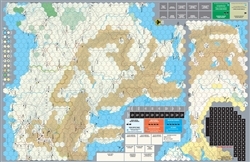 Six month turns keep the game playable, while multiple movement and attack phases allow for operational nuance. Mobilization Points are used to build new units, absorb combat losses, and purchase campaign markers allowing additional activity in chosen sectors. They are always in short supply, increasingly so as economies shrink over the course of the war. Neutrals, wooed by diplomacy, may bring fresh strength to bear. 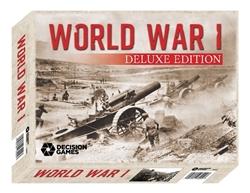 The main scenario covers the entire war from 1914-1918 in ten turns, while short scenarios handle the opening phase of the war (two turns) and the final great battles (four turns). Options include free setup in 1914 and an extension of the war into 1919. Victory comes from wearing down an opponent, either by capturing essential locations or by exhausting mobilization points. In the game as in the war, battle is sometimes necessary for its own sake.